Mesh eyes are all the rage right now! I blogged about some Mayfly eyes last week, but I wanted to show you guys another set of mesh eyes that are are realistic & a lil bit fantasy — with lots of customize-able features. I am wearing Anara Customeyes, this includes a HUD to change Shine (select from several different options), Cataract, Shade, Inner Iris, Outer Iris, Iris Size, Eye Size, and so much more! There are also 16 presets for you to wear as-is, or use as a starting point to customize further. I’m really excited about these! I loved being able to make my own color combination. Visit Anara to check it out! I tried the demo few days back and compared it to FATEeyes – unlimited customisation Version 1.2 (https://marketplace.secondlife.com/p/FATEeyes-unlimited-customisation/3512345). What I did like was the posistion of your eyes, you have more options with the Anara hud and this might be handy for bloggers. You are able to look to your right and left with the FATEeyes but not up and down. What I do know is that the makers of the FATEeyes are still working on the hud atleast so it seems if you read the comments on marketplace and their blog. I had one bug with the FATEeyes (might be sl might be my video card or both) if I turn on full bright and full glow my eyes will turn white when I walk into an area with lighting like a shop or a photo studio. Its not a huge problem for me because I like both styles on my av. But I don’t have this bug with the Anara hud. What I also like about the Anara hud is the amount op shine options and it has more useful presets. FATEeye has some goofy looking ones with it that I will never use. Conclusion: I got both. Time will see which one I will use the most. 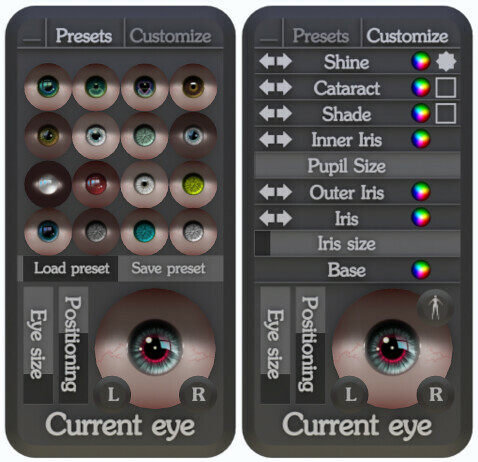 FATEeyes: has an star as inner iris the heart will be in the next release (bron marketplace). It has more iris textures. And an option to select your veines in your eyes. Most important one for me is the pupil actually dilates and contracts like a real eyes. Anara eyes: Posittioning your eyes is easier you dont have to go in edit at all. More shine options I found them more natural. Better presets that will help you on your way but saving your own eyes will distroy an old preset so you might want to make a backup of the hud. And a huge plus is you can minimize the hud. Nice work on your eyes Juicy especially the second one. You can totally make a copy of the HUD and have one that’s all your own presets, and one that’s default.